One of the first issues I bought was X-Factor #100. The issue with a chromium cover where Havok is holding the body of Multiple Man’s body. 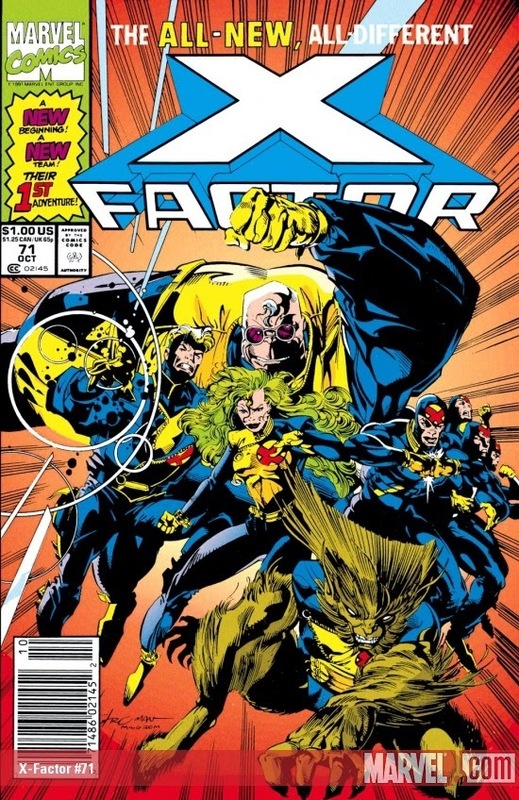 After reading that issue I never stopped liking the X-Factor team in this series. So I grabbed this issue out of the 50 cent section of my local shop when they had a near complete run of it. This was the first issue with the team of Havok, Multiple Man, Wolfsbane, Polaris, and Strong Guy on a government sponsored mutant team. For the most part this issue just covers who the members are and how they fit into the bigger picture of the team. But it also deals with the fallout to the fall of Genosha, and Quicksilver’s powers turning against him. The character interactions are really well done, as you would expect from a book written by Peter David. Strong Guy, Polaris, and Multiple Man really shine while they are sitting around the table making sandwiches. And the ongoing joke of the unopenable mayo jar makes for a lot of fun. This issue ends with a cliffhanger of a shadowy figure shooting Jamie Madrox. The art is what you would expect from a comic of the 90’s. It isn’t early image art, but it sure isn’t top quality. There are panels where faces are incredibly distorted and it is hard to tell what is happening. Despite the art this book is really fun and I plan on reading back through the big chunk of this era of X-Factor I have put together.